GET ON THE FAST TRACK!! Mountain Mods "Bob Slay" brings innovation, mobility, functionality and form to the masses. The Bob Slay is made in the USA entirely from laser precision cut 1/4 inch cast acrylic including the I/O Panel. 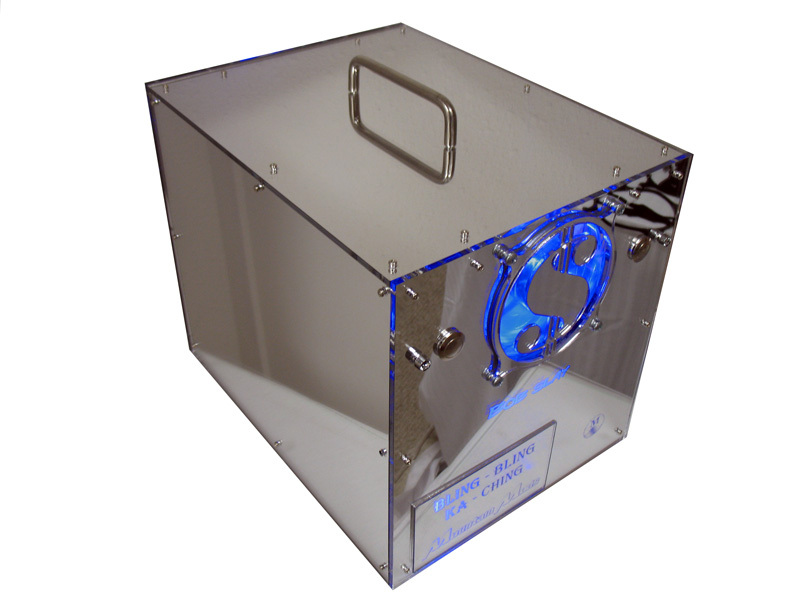 The Bob Slay is sleek, measuring 14.59 x 11.11 x 12.21 inches (L x W x H) while still allowing the consumer to use a full ATX PSU, 2 x 5.25 devices, up to 3 hard drives and a full ATX form factor Motherboard. Many other smaller cases require the consumer to sacrifice cutting edge technology and step down to Micro ATX form factors and smaller PSU's. The Bob Slay is designed for the individual that understands that success demands the use of the latest and greatest hardware. The Bob Slay is loaded with unique features. The case is separated into two compartments. The bottom portion holds the drives and PSU while the Motherboard sits alone on the top giving an unobstructed view of all its' goodness. The Motherboard is also turned at a 90 degree angle. The I/O panel (which usually sits at the back of a chassis) is on the right of the case. This configuration allows for unhindered access to cable connections and ports. This is a great application for those that attend LANS. The turning of the board also places the CPU and memory channels in the direct path of the 120mm intake fan giving optimum cooling for ATX systems with minimal fans. The Bob Slay accommodates a single 120mm intake and exhaust. Other features that elevate the Bob Slay include Nickel Plated antivandal power/reset switches, blue LED's with chrome bezels, and a stainless steel handle for portability. In a gamers world of slay or be slain one must sacrifice nothing. Become a slayer - "Bob Slay"
Empty Case Weight: 10.5 lbs. The Bob Slay comes unassembled - assembly is an option.